Entrusted lending became the second largest source of financing in China in 2013 after bank loans and the largest shadow lending channel. This article explains the entrusted lending channel, looks at why it grew and at how recent changes to inter-enterprise lending rules may impact on entrusted loans. 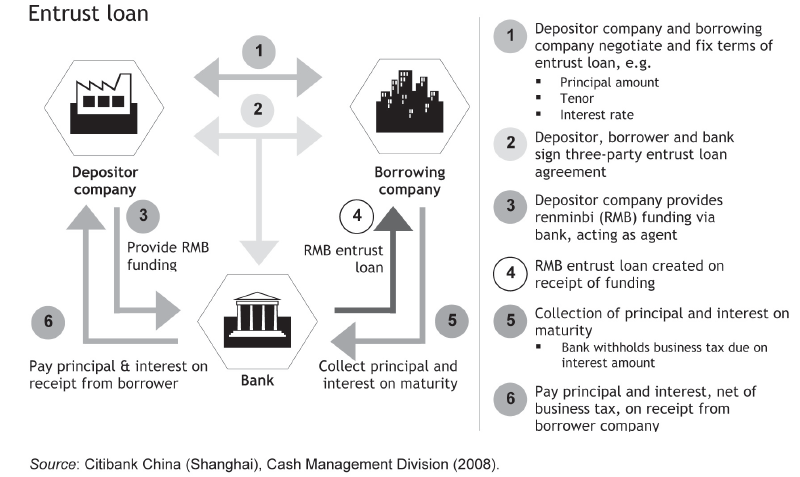 Entrusted lending is a unique feature of shadow banking in China. The ‘entrusted loan’ (委托贷款) channel was set up after a 1996 People’s Central Bank regulation which prohibited direct lending between non-bank entities, primarily between enterprises but also by government entities. The first decade and a half of reform and opening after 1979 opened up informal non-bank financing activity on a large scale. Together with widespread capital and goods shortages, the effect of these reforms by the late 1980s was a stop-start inflationary growth cycle at the macro-level, a crisis in profitability in the state-owned enterprise system and a major non-performing loan problem in the bank system. 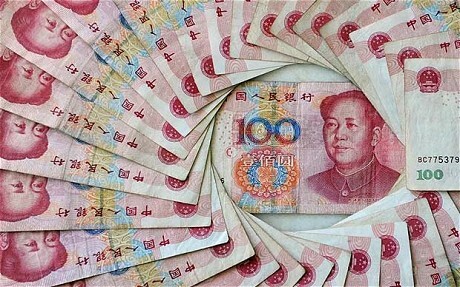 China’s authorities’ were therefore seeking to bring non-bank financing channels under control. But legally choking off direct all forms of non-bank lending posed a problem for ‘legitimate’ financing and liquidity management, particularly among corporate affiliates and from local government financing entities. Thus the ‘entrusted loan’ channel was set up as an official work-around to allow non-bank institutions to lend to each other indirectly via the official banking system. 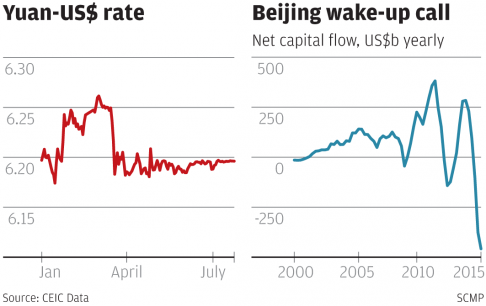 Moreover, until very recently, China’s central bank, the Peoples’ Bank of China (PBOC) had sought to conduct monetary policy by directly controlling monetary aggregates through lending targets–and the ‘entrusted loan’ channel allowed the the PBOC to account for non-bank lending activity via the banking system. Under the ‘entrusted loan’ facility banks conduct an agency businesses to facilitate loans between corporate and other non-bank entities for a fee. Formally, the non-bank enterprise lender retains the risk on the principal and interest of its loan to its designated borrower and the banks get the right to fee income from the ‘entrusted loan’. But banks and non-banks entities could also use the entrusted loan channel to circumvent regulatory restrictions. Until September 2015 regulators had sought to manage bank balance sheet risk by enforcing a 75 percent loan to deposit ratio, which stipulated that banks could not loan more than 75 percent of their deposit base. Because ‘entrusted loans’ do not appear as loans on bank balance sheets’ and are treated as an ‘other investment asset’ banks could use ‘entrusted loans’ to circumvent the 75% loan to deposit ratio by using the ‘entrusted loan’ channel. The attempt by China’s monetary authorities to reign in bank lending between 2010 and 2013 led to a sharp growth in alternative balance sheet lending strategies by the banks, primarily through entrusted lending but also through issuing bankers’ acceptances. As Chen et.al (2016) explain in a recent paper, monetary tightening between 2010 and 2013 led to a worsening LDR ratio for banks, especially for smaller second banks who were more easily squeezed by falling deposits. It was these banks who turned aggressively to alternative lending strategies, such as ‘entrusted lending’ to mitigate regulatory risk of their worsening LDR ratio. Banks could also trade ‘entrusted loan’ assets on the inter-bank market, and this provided further incentives for enterprising banks to build ‘entrusted loan’ businesses. While entrusted lending could provide corporate and other non-bank affiliates with a liquidity and investment facility, entrusted loans could be used to lend to non-affiliates at interest rates above the prime lending rate to restricted industries as well for purely speculative financial investments. From 2005 to 2010 the China Banking Regulatory Commission and the State Council passed a series of increasingly stringent restrictions on bank lending to overcapacity, polluting and ‘risky’ industries – especially real estate related sectors. However, ‘entrusted loans’ did not count as bank loans so they could be used to circumvent lending to restricted industries. The entrusted loan channel could also be used by companies with good access to official credit channels, such as large publicly listed enterprises and local State Owned Enterprises, to borrow at low cost from the banks and to lend at high interest rates to non-affiliates in restricted sectors. For mature firms facing slowing growth, increased credit during the stimulus failed to offset the declining returns on investment in their core businesses, and instead they turned to speculative investment through high interest rate lending, including financing positions in the stock market. A recent paper by Yan et.al. (2015) found that speculative lending through the entrusted loan channel was more common among publicly listed mature firms with lower growth opportunities, particularly where their earning capacity was below the prime lending rate. While the growth of entrusted lending has attracted scrutiny, there has been little firm evidence about the the extent of speculative lending through the entrusted loan channel. The entrusted loan channel was continued to grow in 2014 before eventually provoking a response from the authorities. In January 2015, the CBRC brought in 5 restrictions on ‘entrusted loans’ designed to mitigate speculative investment though this channel by requiring that ‘entrusted loans’ only be used for lending to the ‘real economy’ purposes–and not for investing in stocks, bonds and other purely financial instruments. Two further decisions in by the authorities in China may see a declining role for the entrusted loan channel. First, as part of a wider shift in China’s monetary policy framework away from controlling credit aggregates, the loan-to-deposit restriction was removed by an amendment to the Law on Commercial Banks passed by the National People’s Congress Standing Committee in August 2015. According to the CBRC spokesperson, the LDR ratio had been set up “to control liquidity risk” but it now longer fitted the reality of more diversified bank balance sheets and would instead be used as a ‘a liquidity monitoring indicator’. The LDR ratio became a reason for banks to engage in regulatory arbitrage — and by removing the LDR ratio, banks would no longer be as constrained by the composition of the assets they could hold on their balance sheets. Then, in October 2015, the Supreme People’s Court (SPC), ruled that direct inter-enterprise lending for ‘real-economy’ purposes would also be allowed between non-bank entities–removing the restriction on direct lending between non-banks which had been in place for nearly 20 years. The SPC ruling on inter-enterprise lending was also subject the same 5 restrictions as had previously been applied to entrusted loans in January 2015, including the stipulation that loans must be for ‘real economy’ production and business activities. The move towards an increased role for direct lending also fits the authorities desire for a more asset-based growth strategy. Opening direct lending channels between enterprises will allow corporate affiliates to circulate working capital more easily, but it is not clear how the restrictions on types of allowed lending will be enforced by the courts. Non-bank entities can go to the courts if their loan contract is breached, but they are unlikely to do so if the loan was used for investment in restricted industries or for purely speculative financial investments, which are explicitly prohibited loan use purposes under the SPC ruling. The ‘entrusted lending’ channel will remain, but the incentives for using it are reduced because because corporate affiliates can now legally lend to each other directly and bank lending is not subject to the 75% loan-to-deposit restriction. However, the extent to which the the ‘entrusted loan’ channel will be by-passed remains to be seen. While enterprises can now legally engage in direct lending, finding partners and enforcing contracts can be costly and banks and other other financial institutions have an incentive to engage in the match-making inter-enterprise loans for fee income. The opening of legal direct lending between enterprises also means we can expect more complex structured financing deals to be a growing feature of China’s financial system. Luke Deer is a post-doctoral researcher at the University of Sydney and a Research Associate with the University of Cambridge Centre for Alternative Finance and with the Cambridge Judge Business School. Luke researches alternative finance in China and the Asia Pacific--with a focus on peer-to-peer lending and crowdfunding, and on financial innovation and central banking in China. BRICS, grouping Brazil, Russia, India, China and South Africa, represented a gathering of important emerging economies which were playing an increasingly big role in world economy during last decade.Close economic ties among BRICS countries, especially after the New Delhi Summit, will most likely result in further cross-border merger and acquisition (M&A) deals driven by Chinese companies in other four economies. "Chinese investment enthusiasm into the BRICS has remained strong as economic growth in these, and other emerging markets, has remained relatively intact despite global uncertainty,” said Lawrence Chia, co-chairman of Deloitte China’s global Chinese services group. The aggregate GDP of the BRIC countries (before South Africa joined in late 2010) has almost quadrupled since 2001, from around $3 trillion to between $11-12 trillion in 2010. 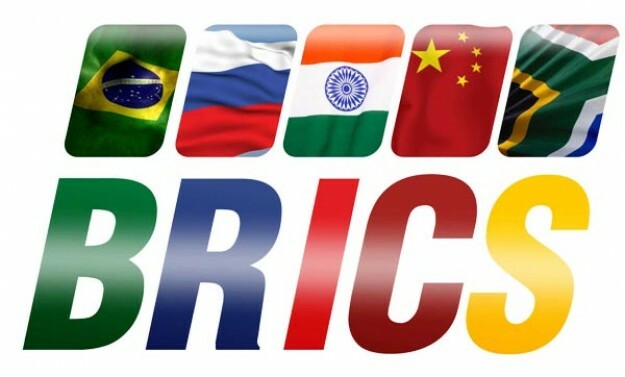 The fourth BRICS Summit was held in New Delhi on March 28-29, under the theme of BRICS countries’ commitment to the partnership of stability, security and prosperity, where leaders of the five countries vowed to strengthen cooperation and boost inter-trade among the BRICS economies. 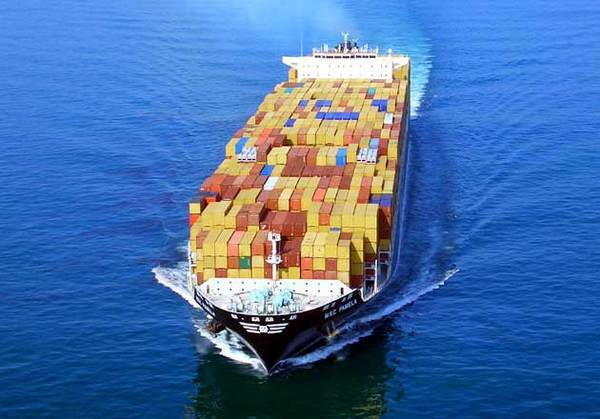 Deloitte forecast that emerging economies will grow by five percent in 2012, compared to a figure of 1.2 percent for developed countries. 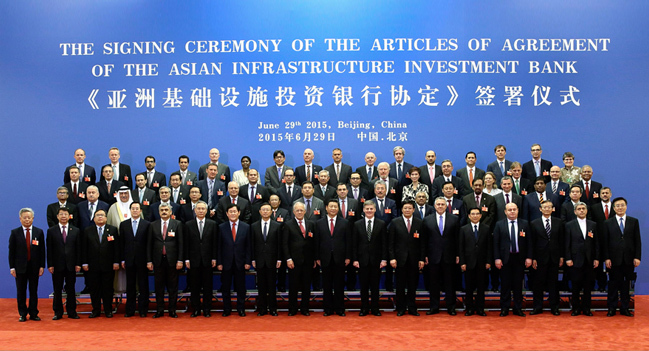 As a co-writer of the report, namely “Lateral trades – Breathing fire into the BRICS”, China believed that cross-border investments between China and the other four BRICS countries will pick up over 2012 and beyond, as “comparatively more attractive growth fundamentals in the BRICS help encourage Chinese businesses to invest in those jurisdictions, as opposed to developed markets”. The report also mentioned that “the desire to escape intense competitive pressures at home” is another reason that leads to Chinese companies’ increasing interest in acquiring in the BRICS.Statistics showed energy and resources sector accounted for 95 percent of the total deal value and 29 percent of the total deal volume in 2011. Chinese consumer businesses, looking to expand into fast- growing overseas economies, became another power in the past acquisition activities. Data showed that outbound consumer business and transportation investments into the four economies from 2009-2011 accounted for 4.5 percent of overall outbound M&A activity by value, while over the 2005-2008 period, this proportion just stood at 1.2 percent.